I’m so excited to put my latest creation – this podcast – out into the world! While the subject matter may be a bit dark, my goal is to be a bringer of light. 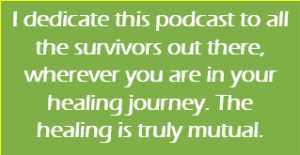 As I use this podcast to bring my story and the stories of others into the light, healing happens. As we tell our stories of healing and share ways in which healing can be moved forward, the light of hope shines more brightly. If you or someone you know has been affected by sexual violence (and, FYI, this is pretty much everyone), this podcast may be of interest to you. nding of sexual violence that is made up of so many of our individual stories. As a result, we have made massive strides in emerging from the proverbial closet of silence and shame around this all too common form of violence. All of this is important as survivors and allies seek justice, advocate for policy change – and yes, work toward healing. I know from personal and professional experience that although saying “me too” is a crucial step, it is just the first step toward healing. The bulk of the work lies ahead. And it is definitely Work. I’ve found that oftentimes doing the Work of healing can feel like a dark and endless tunnel. There are no road maps, no check lists and no timelines available for how to go about this Work. Each one of us must find our own path, but that doesn’t mean we must stumble about blindly. There are many who have gone before, and I’ve been blessed along my own path toward healing to keep finding who or what I need at just the right moment. Perhaps this podcast will be one of the bread crumbs on your path. In my work as a massage therapist and Reiki practitioner and teacher, I bear witness to a lot of pain. I feel the impact of people’s histories in their bodies – in the gripping of hips, the clenching of jaws, the brokenness of hearts. I see the effects of life events in slumped shoulders and lowered eyes, in the way someone pulls away, ever so slightly, when I touch that certain spot on their back. I hear stories untold in inexplicable symptoms – autoimmune diseases, skin conditions, mental health diagnoses. And, when the conditions are right for healing, I bear witness to the let-go, the unclench, the shedding, the opening, the space making, the allowing and the transforming. And so, I have created this podcast as an offering of gratitude. I am grateful for the learning that I’ve gained thus far, for the teachers and practitioners and resources that have helped me along the way. I am also grateful for the teachers and practitioners and resources that will present themselves as I continue to heal, in part via my work on this very project. 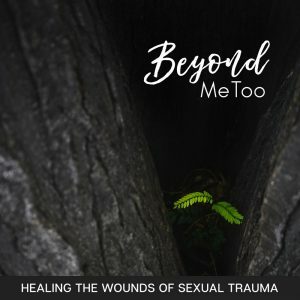 This podcast is both a resource for anyone affected by sexual trauma, as well as a tribute to all those who are doing the hard work of healing. This project asks the question “where do we go from here?” – at both the individual and collective levels. To truly work in the direction of wholeness, we must not only tell the story of what happened to us, but we must also share our stories of healing. That is where we find our strength and our hope – the hope that healing is possible for ourselves, as well as for our society.